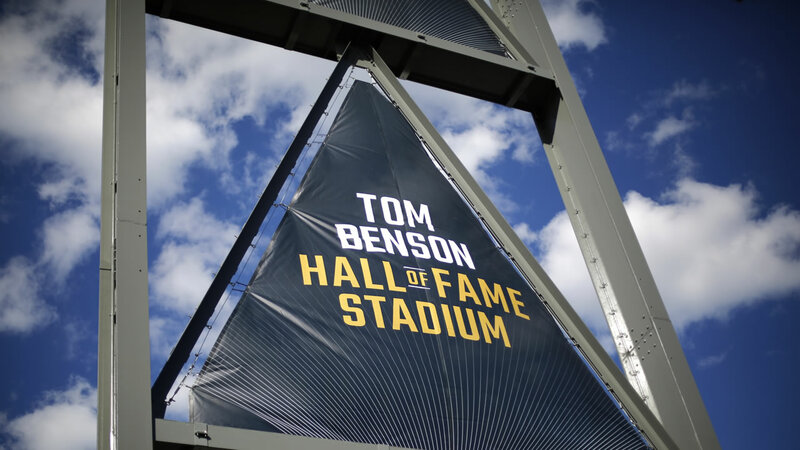 These are signs hanging at Tom Benson Hall of Fame Stadium before the Pro Football Hall of Fame induction ceremony Saturday, Aug. 6, 2016, in Canton, Ohio. Canton, OHIO (KGO) -- The Pro-Football Hall of Fame is welcoming eight new members Saturday in Canton, Ohio, among them are two Bay Area legends. The late great Raiders quarterback Ken Stabler was introduced by his longtime coach John Madden in a pre-taped video. Madden is recovering from hip and open heart surgery. The "Snake" was the league's MVP in 1974 and won a Super Bowl with the Raiders in 1977. Former 49ers' owner Ed DeBartolo Jr. is also being inducted. Under his watch, San Francisco won five Super Bowls.